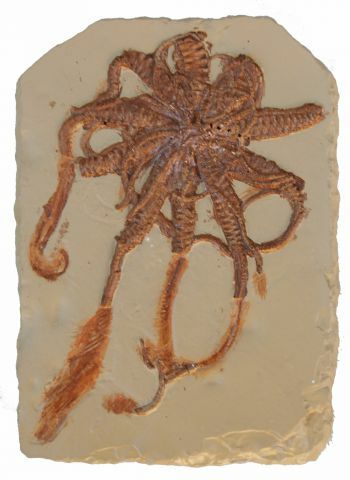 Crinoids are assigned to the phylum Echinodermata, a group of radially symmetrical marine animals, such as the starfish, sea urchins, and brittle stars. Crinoids are commonly referred to as "sea lilies". These flower-like marine invertebrate animals are beautifully colored and live as solitary individuals. This species is characterized by a globular body enclosed by a small calyx, from which freely moving arms extended upward to gather food. At the bottom of the jointed, flexible stem, was a root-like structure by which it was attached to the sea bottom. The third photo is a side by side comparison.